Send one of four HDMI Audio and Video Signals to 8 mirrored displays with this WolfPack™ 4K 4X8 HDMI Switch. This 4X8 HDMI switcher is designed to send an HDMI audio/video signal from one of 4 HDMI sources to 8 displays at once. Easily switch between four video sources using the included 2-button infrared remote or manually using the onboard push-button. The 4x8 Switch sends an audio/video signal from one of up to 4 HDMI sources to 8 - 4K displays all showing the same picture. NOTE: This 4X8 HDMI Switch Splitter is not a matrix device and all 8 outputs are mirrored the same and dependent of which one of the 4 video inputs you have chosen. If you need a 4x8 HDMI matrix switcher Click our 4x8 HDMI matrix switchers. This WolfPack 4x8 HDMI allows access 4-various HDMI sources and can distribute the HDMI signal without loss to up to HDMI displays. 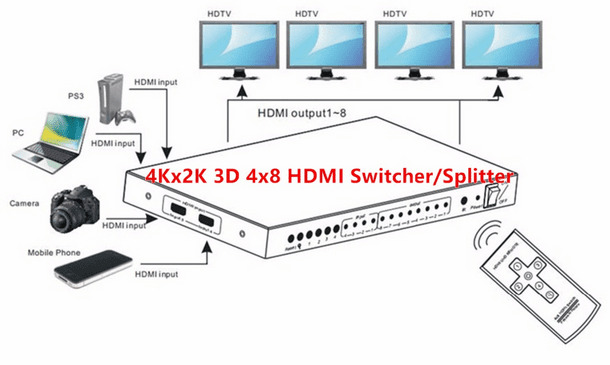 The 4X8 HDMI Splitter Switch supports resolutions up to 4Kx2K@24/25/30Hz. The 4X8 HDMI Switch Splitter also supports EDID RAM. The 4X8 HDMI Splitter Switch allows 4 HDMI devices to be switched easily through 8 HDMI compatible monitor or projector, When multiple sources simultaneously input there is fast switching. The 4X8 HDMI Splitter Switch can also be placed at the end of a long HDMI cable to regenerate the HDMI signal. Supports deep color: 30bit and 36bit. Supports Blue-Ray 24/50/60fps/HD-DVD/xvYCC. Digital audio format,as DTS-HD/Dolby-trueHD/LPCM7.1/DTS/Dolby-AC3/DSD. Supports an Equalizer TMDS Output: 25MHz to 340MHz TMDS clock. Supports up to 340 MHZ TMDS clock rate(4Kx2K) for an HDMI input. Supports 1080P input up to 15 metres AWG24 HDMI standard cable length,output up to 20 metres AWG24 cable length. Inputs can be switched with the IR remote control or front panel button. The 4X8 HDMI Splitter accepts output from all HDMI devices including a DVD player, personal video recorder, gaming console and a set-top box. It mirrors the single switchable HDMI source to up to 8 HDMI enabled displays. Simply select the audio/video source with the included remote control. This HDMI 4-8 Switch supports full 4K/30 and HDMI 1080p video and audio and is perfect for use in commercial and hospitality installations. 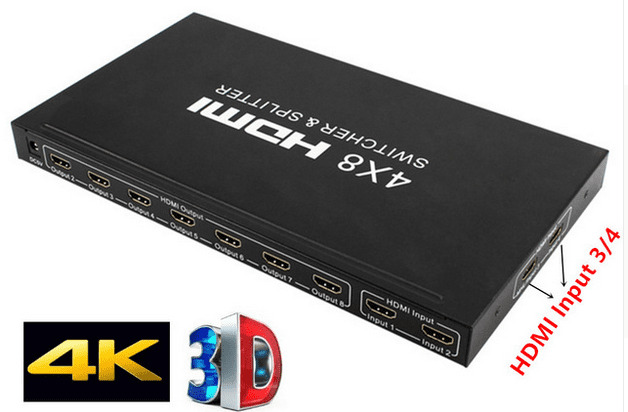 Why not buy this 4X8 HDMI Switch today? HD resolutions including 1080p: Supports todays High-Definition (HD) resolution of 1080p. 1080p Refresh rates up to 120Hz: HDMI displays featuring a 120Hz refresh rate provide smooth, extremely fluid video reproduction. This cable also supports all lesser refresh rates including 60Hz. 12-Bit Color (36-Bits total): Supports color bit depths from 8-bit up to 12-bit color including Deep Color™ Greater color depth allows for more detailed gradations of individual colors displaying billions of colors. Dolby®TrueHD and DTS-HD ™ Surround Sound: Supports Dolby TrueHD and DTS-HD lossless surround sound. This is optimum audio technology for a superior home theater experience. x.v.Color™Extended Color Range: Supports HDTVs with xvYCC color, also known as x.v.Color. The x.v.Color range expands the number of available colors for nearly twice as many colors than standard RGB color. Lip Sync: Lip sync capabilities allow for a processing delay, so that both audio and video signals are synchronized and are output together. This greatly improves the viewing experience for the viewer. Why not buy this 4X8 HDMI Splitter today? Q: Is this 4X8 HDMI Switch a matrix switcher? A: This HDMI switcher / splitter is not a matrix device and all 8 outputs are mirrored the same and are dependent of which one of the 4 video inputs you have chosen. If you need a HDMI matrix switcher see our HDMI matrix switchers.